The USS DIXON (AS-37), a L. Y. Spear Class Submarine Tender, was commissioned on 7 AUG 1971. USS DIXON served her country for 24 years, 4 months and 8 days, until decommissioned on 15 DEC 1995. Built in Quincy MA, USS DIXON was commissioned in Norfolk, VA and then steamed for her homeport of San Diego, CA. She spent ten years close to home on the West Coast, then made her first West Pac - Indian Ocean deployment in 1981. The cycle repeated with ten years passing again before another West Pac in 1992. USS DIXON tended the Fleet, winning numerous awards for Technical and Service Excellence over her career. 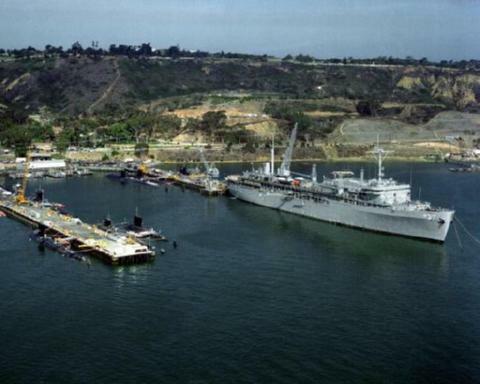 In October 1995 she transited the Panama Canal, headed for Norfolk, VA. She was decommissioned in December 1995. In July 2003 the hulk of DIXON was sunk in a Fleet exercise off the coast of North Carolina.